It’s finally here. Today is the day Marty and Doc travel to in Back to the Future: Part II. October 21, 2015. It’s a little strange that it’s actually here. It seemed so far away as a kid. 2015! The future! Now it’s here… and it’s nothing like what was shown to us. Back in 1989, we got a glimpse into what our lives would be like in the far off year of 2015. Flying cars, $50 Pepsi, hoverboards, shoes that lace themselves!! Oh, man. I couldn’t wait. Boy, did they get it wrong. How could they have predicted the internet or cell phones? There’s still a phone booth in the BttF’s 2015. Sigh. 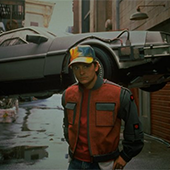 Still, watching Back to the Future: Part II on Oct 21, 2015 is something I’ll never forget. Part of my childhood coming back around to meet me as an adult. Maybe that sounds lame, but to me it was thrilling. Whether you watched it at home or got to see it on the big screen again (like I did), I hope you enjoyed watching it again. Now sit back and relax and listen to the guys talk about all things Back to the Future in our 40th episode. Enter The Empire Strikes Back. Star Wars Part 2. It’s darker. Our heroes are broken up; Luke is on a different planet while Han, Leia and Chewie are trying to outrun the Empire. And then there’s the big reveal. Maybe the biggest reveal ever. Join the guys as they discuss the amazing second installation of the Star Wars franchise. WARNING: This episode also spoils the films The Sixth Sense, The Usual Suspects and Return of the Jedi. If you haven’t seen those movies, you may want to watch them before listening to this episode.